PASCAL Fire Suppression System | What is PASCAL ? PASCAL is a self-generated Aerosol Fire Extinguishing Agent, and is one of the most efficient Halon Alternative products currently available. PASCAL is a new class of fixed fire extinguishing system using solid propellant aerosol technology. 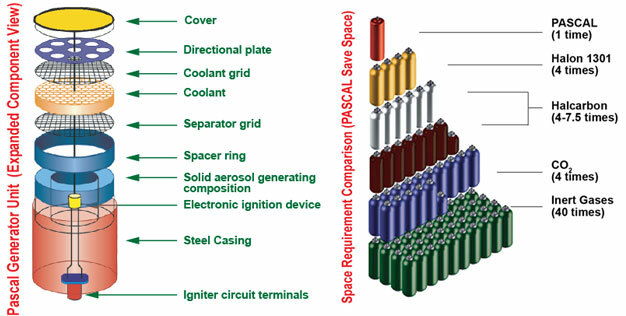 Unlike conventional fire extinguishing systems, PASCAL is stored as a stable solid chemical compound which when activated generates a fire-fighting aerosol. The extinguishing medium however is not stored in a pressurised cylinder; it is produced in-situ only when required. The aerosol is a mixture of gases and micron-sized solids, possessing gas-like distribution properties and long holding times, totally floods the protected enclosure and rapidly extinguishes any fire present. The solid aerosol-forming compound, together with the solid cooling element and activation devices is contained in a small non-pressurised canister with one or two end-plate delivery nozzles. The canisters are called WIN generators and vary in size depending on the mass of solid aerosol-forming compound contained in the generator. WIN canisters are very compact and normally placed inside the protected enclosure. PASCAL aerosol is non-conductive and non-corrosive. As PASCAL aerosol stays in suspension for extended periods, it can be removed from the protected area by any airflow. Solid fraction of the aerosol that has settled can easily be brushed, blown or washed away. WHY IS PASCAL YOUR BEST ALTERNATIVE?